Downtown Fort Worth is an exciting vibrant place to visit. Beginning in 1968 with the construction of The Tarrant County Convention Center (now The Fort Worth Convention Center) the city began to build a multifaceted downtown economy. Downtown Fort Worth has steadily become home to new state-of-the-art office buildings and revitalization of several historic buildings that are now home to businesses and corporate headquarters. The city has steadily nurtured the convention industry as well as a retail and restaurant economy that has transformed the city center into a destination for locals and visitors alike. Beginning in 1999 downtown condos and apartment communities began popping up through both new construction and renovation of historic sites for housing. With the opening of Sundance Square Plaza in 2014 people suddenly noticed that a downtown lifestyle was not only possible but desirable. Today there is a limited supply of downtown condominium and town home inventory, but a plentiful supply of apartment options. Slowly now, new condo projects are being projected and built into the downtown skyline and into areas surrounding the downtown district. The T&P Lofts were converted in 2005 from the 1930 Texas & Pacific Passenger Terminal. 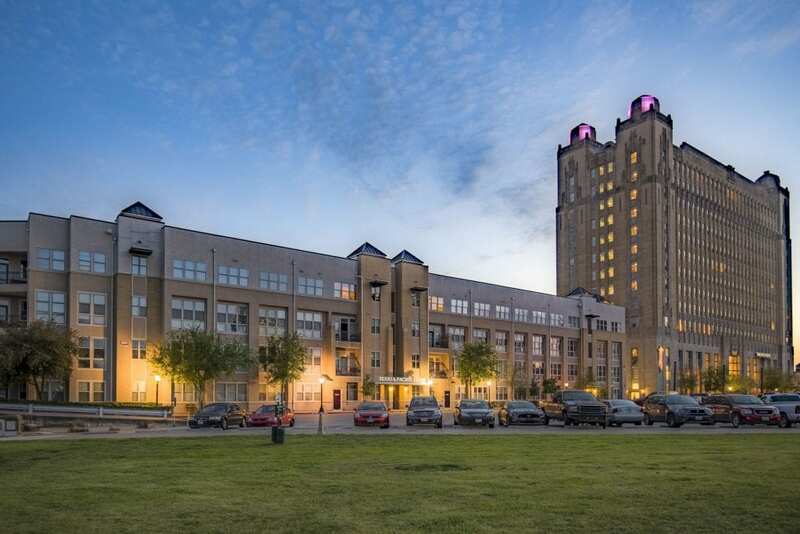 An historic building on The National Register of Historic Places, “The T&P” now features 136 condos in the original high rise and 92 units in the newly built mid-rise building. Amenities include 24/7 full service professional concierge, gated & secure covered parking, fitness center, indoor resistance pool, 3 beautifully landscaped courtyards for grilling and relaxing outdoors, business center, on-site event venues and The T&P Tavern which is the original train station cafe, now featuring 24 craft bears on tap, full bar and a menu including sandwiches, salads and appetizer items. The T&P Community is a short 12 minute walk to Sundance Square and sits at the gateway of the near Southside redevelopment with easy access to Magnolia Avenue and the Trinity Trails. More information about The T&P Lofts can be found here.